Is a Percolator Different From a Moka Pot? People often approach me with their questions regarding the percolator-moka-pot issue and it seems like a fairly common point of confusion. Many people simply don’t seem to know if the two are different or not! It’s essential to know what both of these things are and what their features are so that you can know if you want to try either or even both of them. Even if you’ve already made a coffee choice between the two, it still might be a great idea to find out what you’re actually in love with! 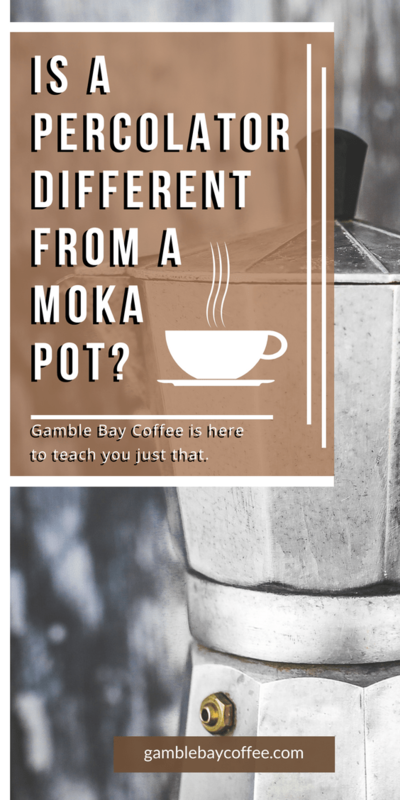 Gamble Bay Coffee is here to teach you just that. In today’s article we are going to take a look at what these things are, what the main features of each of them are and how they differ from one another. We really hope that you will be able to learn something new from this article and strongly recommend you read til the end. Let us begin by taking a look at what these actually are. What is a Percolator and what is a Moka Pot? A percolator is essentially a single-unit piece of equipment that looks pretty much like your typical coffee pot. Boiling water is circulated inside it for up to five minutes straight. Unlike other methods, this extracts (and often over-extracts) the coffee from the ground beans. A moka pot, on the other hand, is a stove-top or electric coffee maker. What it does is that it passes boiling water through the coffee grind with the pressure derived from the steam caused by the water boiling. The total setup of the moka pot has three sections inside it: the part which boils the water and creates the steam at the bottom, the coffee grind chamber in the middle, and the collection chamber at the top. Naturally, since the water is literally boiling, the moka pot usually registers short periods of brewing. Mechanism: The percolator is essentially a single unit. It has only one chamber where you put the ground beans and the water that goes into the making of the coffee. The moka pot, however, is not a single unit, as I just explained, it is fundamentally three units that work together. Fundamental Drawback: The percolator suffers from one serious drawback, which lowers it popularity with many people. It actually ends up brewing the same coffee over and over again for as long as it’s running because of the way the water circulates. The moka pot does not circulate, so is free from this flaw, but that means your boiler can run dry if you allow it, which is potentially hazardous. Extraction/Density: Because of its constant brewing, the coffee is often over-extracted in case of a percolator, making the coffee really dense and too strong for many. The moka pot provides you with a single extraction. Type of Grind: In case of the percolator, a comparatively coarser grind is used to keep it as far away as possible from the boiling water. In case of the moka pot, finer grinds are what I have mostly seen used because that lets it extract the flavor during the short brewing period. Time needed: The percolator takes a longer time to brew your coffee while the moka pot boasts of a comparatively faster brew. This is one of the things you might want to keep in your mind if you’re looking to quickly get your coffee. Durability: Both of them have machines with a fairly high level of durability, naturally, since you’re buying quality products in any case. However, it has been seen that percolators generally have a greater level of durability because they have a comparatively simpler mechanism. General Preference: Most people tend to go for the moka pots because they don’t like the dense flavor that the percolator provides you with. However, there are some people who would sooner stop drinking coffee than shift from a percolator. Pricing: Now, pricing is a really complicated thing to discuss in this case. Since pricing varies based on several things ranging all the way from the machine you use to the beans you buy, there is really little we can do. In fact, pricing also varies based on the color of the model- you might find the black version to be 20 percent more expensive while everything else is just the same. So, depending on your choice, either of them might be more or less expensive. When we started off this article too few people actually understood these differences, although they are fairly simple to understand. Here’s a few more points to keep in mind when you’re considering trying these coffee brewing methods for yourself. Keep in mind that the percolator actually boils your water with the coffee that drips down! If it gets too hot, it can get more bitter than you want, so that’s something that you always have to keep in mind. If you don’t want a dense coffee, a percolator is not the right option for you. Another thing to keep in mind is that these two brewers work in fundamentally different ways and that affects their taste, price, and even look. We won’t say which one is better or worse, since it varies from person to person, but that’s something you should keep in mind. Gamble Bay Coffee is here for YOU! We want you to know that we are always here for you and we want you to understand that we actually care about you. We understand that there might still be a lot of questions that you might have, since we can’t imagine them all! But as I just mentioned, we are always open for you! You can reach out to us anytime you want and we will try our best to help you out with any concern that you might have. Please know that you can always discuss any confusion or approach us with any query that you might have. We hope that this article was something that you could learn a new thing or two from and we thank you for taking your time and reading it. At the same time, we would like to ask you to stay tuned for more articles or browse around the site! Looking forward to having you again!